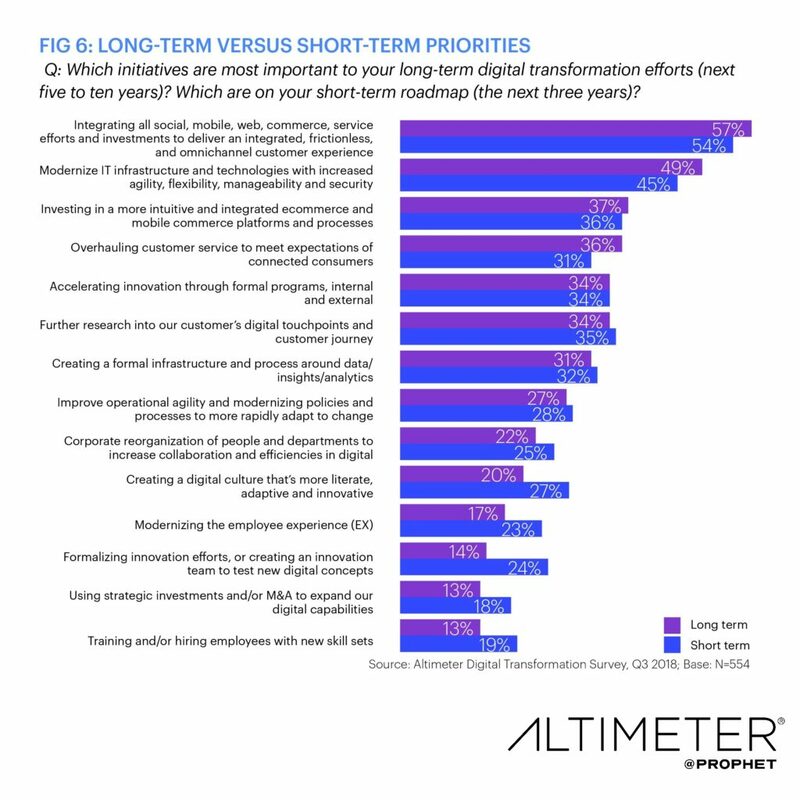 In Altimeter’s latest research, “The State of Digital Transformation,” we observed that the most progressive organizations are prioritizing customer experience investments in short-and long-term digital transformation roadmaps. And, not only do customers directly benefit from these efforts, but companies are also accelerating the modernization of cross-functional operations and business models to better compete in quickly-evolving markets. The ongoing tug-of-war between CIOs and CMOs over digital transformation has ended, and it is customers who ultimately win. For the better part of 10 years, digital transformation was, unsurprisingly, about “digital” and how and where CIOs and IT leaders were investing in next-generation technologies. Cloud, mobile, social, apps, IoT, et al., represented significant updates and upgrades to technological infrastructures aimed at scaling and improving operations and performance. But CIOs weren’t the only drivers. CMOs recognized the rapid adoption of the same technologies among customers and how they were dramatically reshaping behaviors, preferences and outcomes. This led to a historical tug-of-war between CIOs and CMOs, the two early adopters and leaders of digital transformation, as to who “owned” digital transformation. While CIOs focused on infrastructure, CMOs set their sights on renovating customer touchpoints and supporting back-end systems. According to our research, that purported war seems to finally be over. 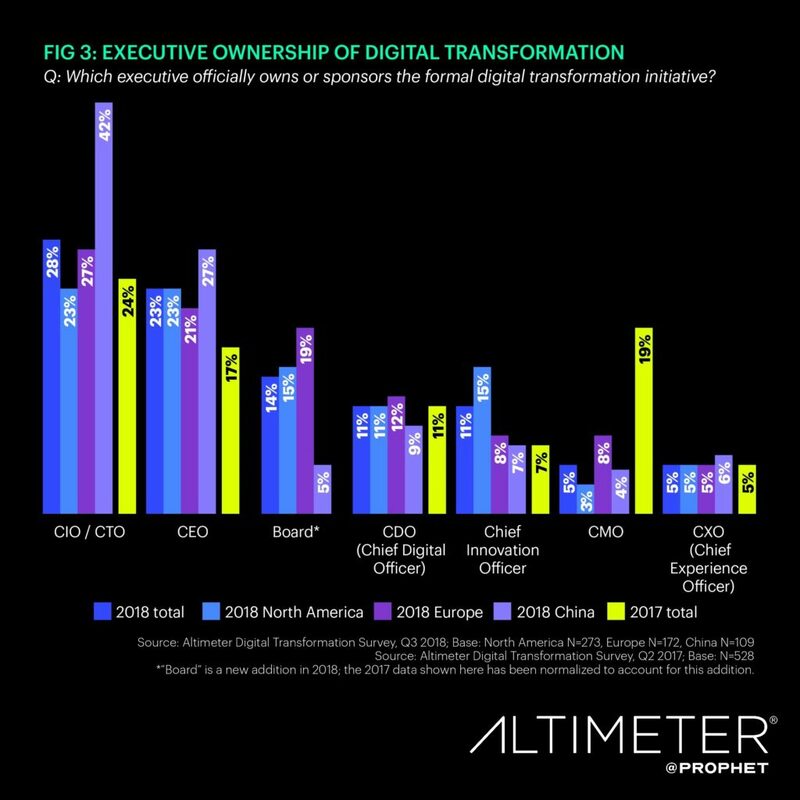 This year we saw a noteworthy drop (-77%) in marketing’s executive leadership of enterprise-wide digital transformation efforts (5%). While it seems that CIOs may have won the contest, the truth is that the competition is benefitting organizations and customers alike. 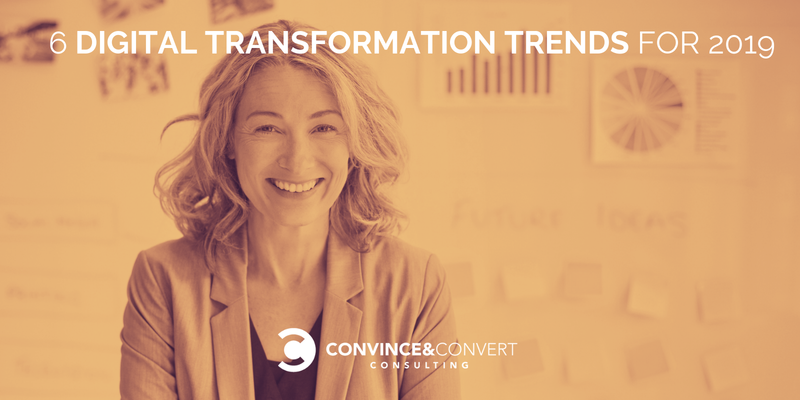 In the past, marketing was a logical starting place for digital transformation efforts, as CMOs aimed to update how companies engage customers and modernize customer touchpoints. Now that mission is even more critical. New devices, apps and on-demand services are driving new customer behaviors and expectations. At the same time, mobile, big data, AI, machine learning and digital influence represent enablers for innovation beyond marketing, expanding the role of CMOs to now include customer engagement, experience, loyalty and lifetime value. Upon further study, we learned that the rise in CIO ownership does not at all mean that CMOs are losing stature in digital transformation leadership or influence. In the past, marketing was a logical starting place for digital transformation efforts, as CMOs aimed to update how companies engage customers and modernize customer touchpoints. Now that mission is even more critical. New devices, apps and on-demand services are driving new customer behaviors and expectations. At the same time, mobile, big data, AI, machine learning, digital influence, et al represent enablers for innovation beyond marketing, expanding the role of CMOs to now include customer engagement, experience, loyalty and lifetime value. As digital transformation matures, the purview targets complete business modernization to drive growth and performance. Customer experience, as a result, becomes the catalyst in uniting the enterprise. For example, CIOs are looking beyond infrastructure, becoming business partners to key functions across the organization. CMOs, in partnership with IT, are honing their focus on the digital transformation of the traditional marketing function as a whole, modernizing it for CX, for sales force collaboration, and for direct-drive revenue. Over the years, the top drivers for advanced digital transformation efforts have consistently revolved around two things: 1) modernizing technologies across the enterprise and 2) investing in modern customer experiences. Now, competing for new market opportunities also becomes paramount. More than half of the companies (51%) we surveyed reported that they are investing in growth opportunities in new markets, making it the leading driver for digital transformation efforts. Studying evolving customer behaviors and preferences rank second at 46%. The third leading driver is increased competitive pressure (41%). The reality is that customer touch points must be updated continuously as fractured, dated, or unintuitive ones impair the customer experience and introduce fissures into customer relationships and loyalty over time. As such, CX-focused efforts represent a significant cluster of short and long-term digital transformation priorities to enable a more customer-centric and real-time infrastructure. CX investments represent immediate areas of opportunity, but also show that companies are focusing on keeping customer touch points up-to-date and relevant in the long term. As customers become more and more comfortable with mobile and emerging technologies, CMOs are aiming to understand these connected customers’ shifting expectations and preferences better through real-time data and analytics. Additionally, CMOs are employing new programs and services that consistently meet the needs of their connected customers as times and trends evolve. Customer experience will only continue to serve as a primary catalyst for digital acceleration and maturity. As a result, elite CMOs are shifting the role of marketing to create a business growth engine focused on CX, performance and innovation. This may reduce the current need to participate in organization-wide efforts. In due time, however, this valuable front-line experience and expertise will place marketing back in a leadership position as organizations increasingly place customers at the center of their digital transformation initiatives. 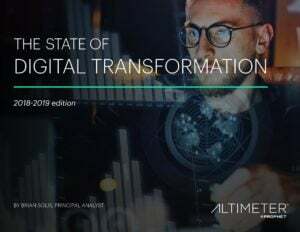 Please download Altimeter’s 2018-2019 State of Digital Transformation for a complete look at the evolving enterprise. 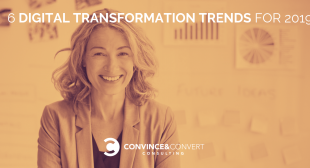 The post 6 Digital Transformation Trends for 2019 appeared first on Convince and Convert: Social Media Consulting and Content Marketing Consulting.